I grew up watching movies like "Back to the Future" wishing I could do the same thing for a day—just hop back into another time for a minute. Gone are the days where one will see two young gooey eyed sweethearts sitting in the local drug store with two straws in the same milkshake. I even searched online the other day to get milk delivered, but they bring it in plastic pints and not glass... I could go to the store and do the same thing... not very romantic. But enough about my ranting. Today, however, I went back in time. Sort of. 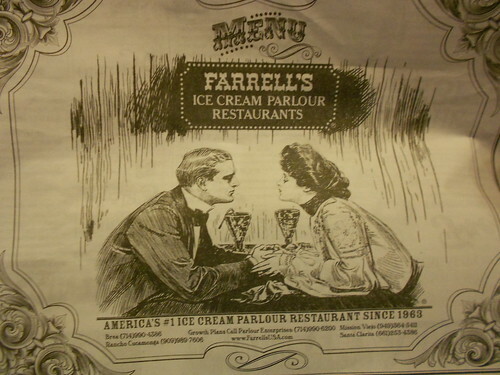 In Brea, fourteen miles east of Downey, there is a place called Farrell's Ice Cream Parlour. It's definitely an experience. Loud, obnoxious, and over the top, their ice cream is heaping and sweet. 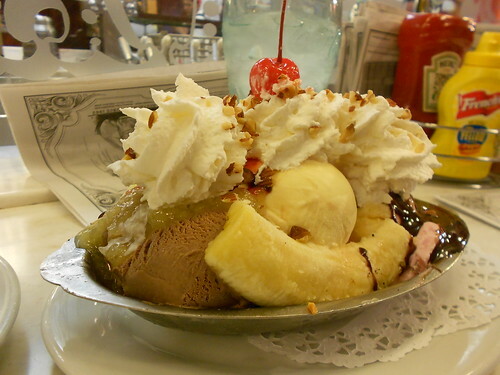 The diner looks as if you stepped into a 50s candy store with an ice cream parlor in the back. 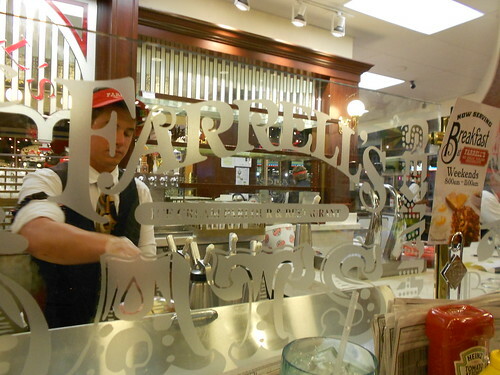 We sat at the soda fountain counter and watched as the boys made the chocolaty delights. A picture of the front of their menus shows the atmosphere they've recreated in here.